I've been outside working as my weeds are taking over. I spent about 4 hours in the back yard working in the strawberry and lavender beds. At 2:00pm I took a lunch break and just couldn't make myself go back out. It's about 92 here today. Here in Kansas, we have to put sulfur powder all over ourselves to prevent chiggers while doing yard work.....I've never seen a chigger, but I've been a victim of their crimes against humanity. You can literally scrape your skin away scratching after one bites you. The itch is just that bad! Usually they are the worst about 3:00am in the morning. So, no perfume for me....just sulfur. I smell like rotten eggs....but it's worth it. It's too hot to work outside so I thought I would write to all of you. (Not to worry...I've showered ...no sulfur in the house.) Great day for show and tell. I love seeing your work. Many thanks to all who have sent pictures. The picture above is from our friend Maria from Italy. Visit her blog to see how she finished this piece. She put it on the cover of a box. Click on her name and scroll down her blog for her May 20th. posting. "I just posted on my blog today the picture of my interpretation of your freebie "Now I Know My ABC's"... I thought you may like to see it, so I attach the picture to this mail, I stitched it on a 32 ct brown linen with two threads I've dyed myself, I hope you'll like my finish. The fabric on the back of the pinkeep is the same as the fabric on the table. The next pictures are from Peg and Janis. Peg writes, "Just wanted to share with you a few photos of my friend Janis Beagle's Summer House Pincushion. We followed your instructions, with a few design modifications and are very pleased with the finished product. Love the design, fabulous. Also, is the Sweet Heart Pincushion that I made for Kindred Spirits Sampler Guild, for our fund raiser in March. I added antique lace and button that were my Grandmas. We both thank you for all your inspirations and creativity." Catherine also made these cute notebooks from Niki's strawberry pattern in Joyeux Noel. Nancy LaCaze and her sister Laura Denson live in Arkansas. They each make the same quilt and show the other their progress on web cam. This is their Patriotic Summer Quilt. The panel across the surface of their quilt is from "Summer Holiday" from the book Summer Weekend. 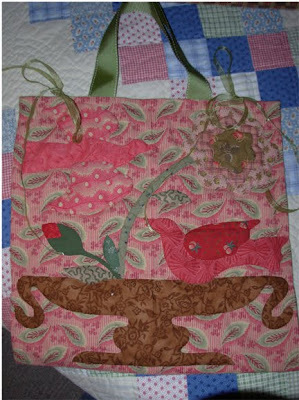 They used a block from Birds of A Feather to embellish this tote. 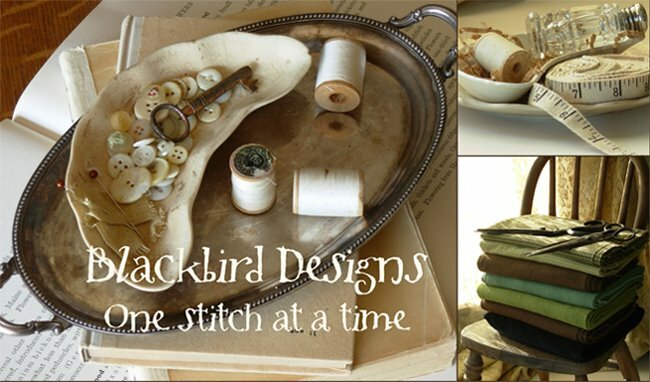 It's not the first Blackbird Design that have I stitchd, and when I finish one, I always feel proud of my work.. it's because your projects are heartwarming!! Thank you :-)" Click on Paola's name to go to her blog. I have to continue this tomorrow! I just looked at the clock...YIKES!!! Dave and I are going to a movie tonight. They're all so beautiful! It must be so gratifying to you to see what people do with your designs. 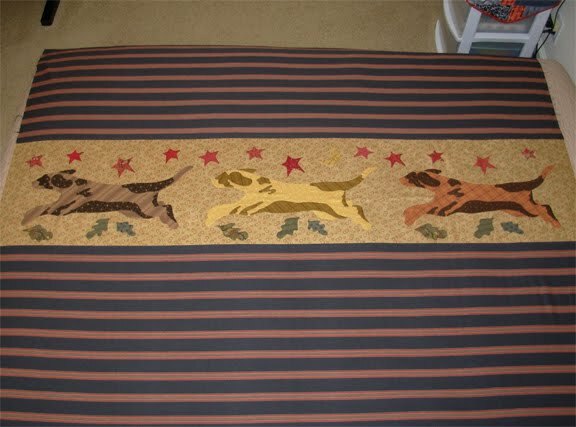 Oh, the dog quilt!!!! Brava. It was a hot one out there today. I did a lot of bike riding. Your pieces are adorable. So pretty! Thanks for sharing these with us. I so enjoy that you share the items that get made with your designs with all of us. 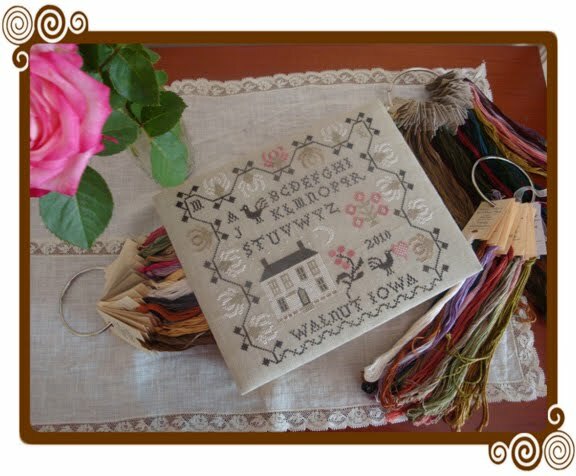 What a nice surprise to check your blog tonight and view all of the photos of the beautiful work completed by your needlework fans. They are all truly beautiful, I especially loved the first one done with her own dyed threads. What a great complement to you both and your designs. I love to see different finishes of your designs, and all of these are just beautiful! But then, the designs are beautiful to begin with! Love all the finishes, but I have to say I am partial to the Janis/Peg finish as they are dear friends of mine! 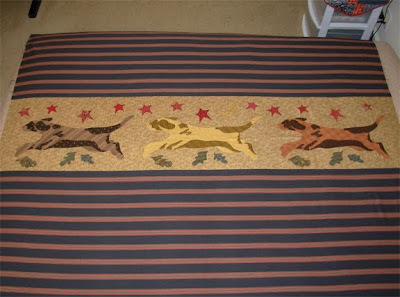 I have seen that one in person and have it ready to go with my own "projects to start"...keep up the good work, Barb and Alma - and the good work to all of us who stitch/finish your great designs! Everything is so lovely, we can pick out other ideas to finish your work. It is a great idea ! So now, I am looking forwards for tomorrow. I hope the movie was great, what was the title ??? All adorable this works, with this designs. Such beautiful projects! I need to get back into stitchery and try some of these. Yuk, I've googled "chiggers" and didn't like what I saw... fortunately I don't think we have those here, hot weather seems enough disturbing to me! Ah, yes: chiggers. They are most terrible and I've gotten more bites than I can count just from walking through a front yard in the midwest with flip-flops on. Nothing itches or swells like a chigger bite. These pictures are so amazing--truly inspirational! Absolutely lovely, of course. I love,love,love the dog panel! Alma, do you know where I can find the book Higdon Camp-1924? 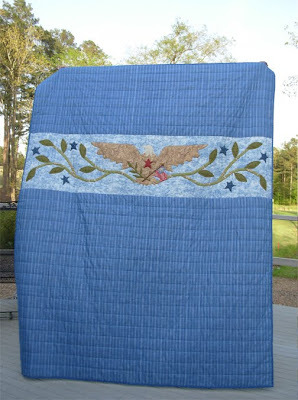 I would love to make the furled flag quilt. PLEASE>>PLEASE>>>PLEASE Run a re-print of the Camp Higdon-1924 book. There are literally 100s and 100s of us out here who would LOVE to buy a copy!!! YES we are begging!!! Yes please I want to make the quilt of the flag also. I cant find it anywhere..
BLACKBIRD DESIGNS ~ "Higdon Camp - 1924" ~ Quilt Book !